Q. 10: Can we attend the Masses offered under the provisions of Summorum Pontificum? Can we attend the Masses offered under the provisions of Summorum Pontificum? 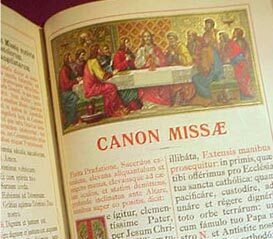 The motu proprio, Summorum Pontificum, has changed the juridical situation of the Mass. Until recently, the traditional Mass was presented as being prohibited and allowed only under an indult, that is, a special, exceptional permission joined with special conditions. Pope Benedict XVI has changed the juridical situation of the Mass stating that the traditional Mass has never been abrogated. Thanks to this statement, the Mass has been reestablished as a universal law of the Church and can no longer be considered as prohibited or even as an exception. Unfortunately, the expression "extraordinary form" used in the motu propio is misleading. Though the juridical issue of the Indult no longer exists, some items from these articles regarding the Indult are still pertinent to the application of the motu proprio. The growth and fruits of Catholic Tradition; why does Rome refuse the Tridentine Mass? about the SSPX with this select group of informative conferences and articles. Did Pope Paul VI abolish the Tridentine Rite of Mass? An article regarding the legality of Quo Primum. Written in 1997 and vindicated 10 years later!